Whether it’s at work or from friends, feedback helps us move forward and improve in both our personal and professional lives. In fact, 69% of employees say they would work harder if they knew their efforts were being recognized. Unfortunately, less than 30% say they actually receive regular feedback. Studies show that companies benefit in numerous ways from having a reliable feedback process model, so why aren’t managers delivering feedback more often? Simply put: giving and receiving feedback is hard. Feedback is delivering evaluative or corrective information to be used as a basis for improvement. Sounds easy enough, right? If the number of books, courses, and articles about performance feedback models are any indication, the answer is a definitive no. While the feedback itself may seem straightforward, its effectiveness depends upon its delivery. Feedback is generally broken out into two types: positive and constructive (sometimes referred to as negative). And as much as we would all love nothing but positive feedback, there can’t be any growth or improvement if we don’t gain insight into what needs change. Focus on behaviors and actions, not the person. At the end of your feedback session, you should discuss a time to follow up and track the individual’s progress. The most effective feedback requires empathy, strong communication skills, and trust. With those three pillars in place, both positive and constructive feedback become easier to give. Your employee knows it is there to help them progress. What does ineffective feedback look like? All these seem like common sense, right? But it’s easy for these conversations to turn into venting sessions or become sidetracked by emotions. Keep in mind that your feedback won’t automatically be effective just because you have delivered it—you must make sure the receiver is even open to receiving it. It’s the package your message comes in that makes all the difference. Having reviewed what effective feedback is and isn’t, let’s look at some trusted and efficient performance feedback models used across industries and various disciplines. Situation: Describe the situation with specifics. Behavior: Describe the behavior observed; do not try to guess at motives or causes of the behavior. Impact: Describe the impact the observed behavior had. The SBI model is a favorite among organizations for its succinctness. It also keeps emotions out of the process. It’s important to use “I” statements and withhold judgment when using this feedback model; otherwise, it will undermine the feedback you’re giving. 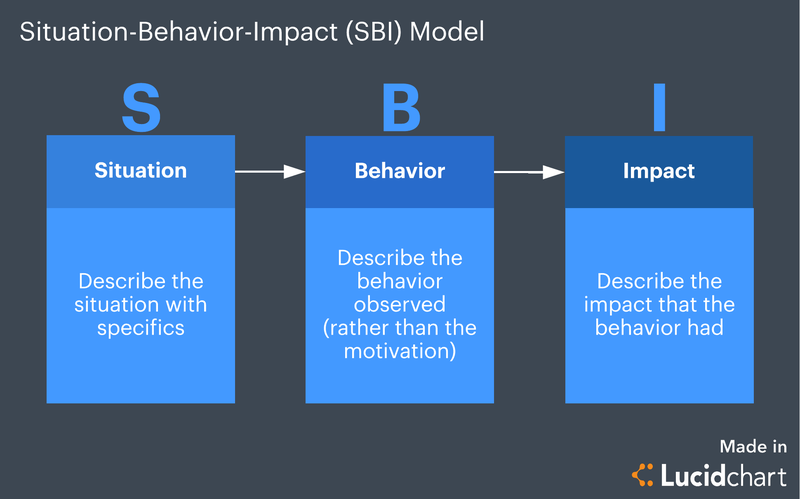 Other feedback models use similar steps, such as BEEF (Behavior, Example, Effect, Future) and AID (Action, Impact, Development or Desired Behavior). The BIFF model (Behavior, Impact, Future, Feelings) adds an additional step at the end to gauge how the individual feels after receiving the feedback. Whatever acronym you choose, you can’t go wrong when you clearly define the unacceptable behavior, the effect of that behavior, and the changes you expect to see. Pendleton’s feedback model encourages the person receiving feedback to be an active participant. It allows for self-reflection during the process, rather than after. Check that the employee wants and is ready for feedback. Let the employee give comments/background to the behavior or situation that has been observed. The employee identifies what went well. The manager identifies what went well. The employee states what could be improved. The manager states what could be improved. The employee and manager agree on an action plan for improvement. Pendleton’s rules put the individual receiving feedback in a more open state by letting them start the conversation and guide each section. This feedback model also helps the employee feel heard, a critical piece that other processes sometimes miss. The process of giving effective feedback can be tricky to navigate, but with the tips and process models above, you can hone your feedback skills. Use Lucidchart to keep employees and managers on the same page. 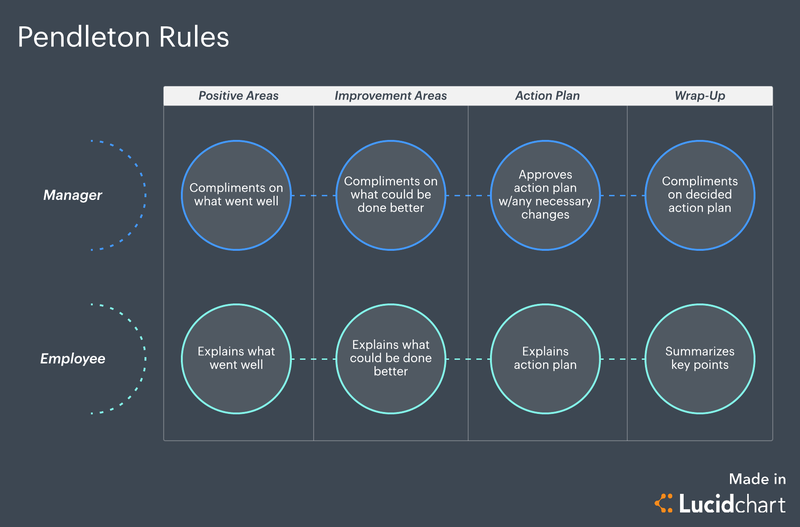 Whether you map out the situation, behavior, and impact of your feedback or create a timeline to track progress, visuals can clarify expectations and help to bring the best work out of anyone.